It was always my dream to fly into Alice Springs and drive to Uluru and Kata Tjuta. 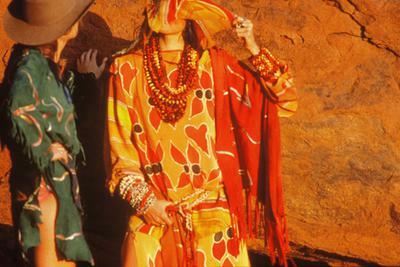 In 1980 my first trip to Alice Springs – the Red Centre – became the central theme of my Bush Couture collection, expressed in landscape-inspired designs such as Coolamon, Uluru, Ayers Rock and the Olgas..
My passion for the landscape, Aboriginal art and culture was already a strong force in my work and in my way of being. So hearing about the different communities and the textiles beginning to be produced was of great interest to me. In Alice Springs I met Robyn Davidson, Jenny Green and Julia Murray and was told about the batik being done at Utopia. I kept in touch with Julia and met some of the women at an exhibition of their work in Sydney. I loved it all, and an invitation to visit Utopia followed. In June 1982 I flew back to Alice Springs with Lydia Livingstone and Fran Moore. Then we drove with Julia in the huge four-wheel-drive out to Utopia Station and later on to Uluru and Kata Tjuta – my pilgrimage. 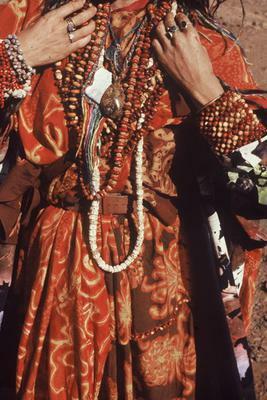 As I had already collected some Utopia batiks, I was draped from head to toe in my ‘bush couture’ – Utopia silks and opal jewellery. It was an incredible opportunity to meet the artists and show them what I had created with their beautiful art. 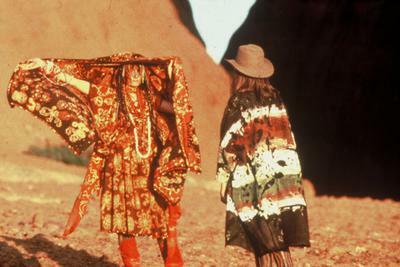 I was the ultimate Desert Nomad Warrior Woman, with real Sturt’s desert peas in my hair. My days at Utopia were spent visiting the different groups of women on the outstations, collecting their new work and starting new pieces with them, dyeing the background colours, relaxing by the fire in the bright, clear light, drinking cups of tea and eating damper. The women laughed a bit at my clothes and I laughed too. But Emily Kngwarray and I discovered that we had on the same number of skirts and tops! The women all loved their layers too. I loved watching the women work on their batik, seated together on the red earth, marking and drawing on their silk and cotton. Sitting near the fire with the pot of wax, I loved the freedom and sureness of their lines and marks. The batik and dyeing technique seemed so suited to the heat and dust of the desert, the silk dried rapidly in the hot sun and the layers of colour could be added quickly. I felt connected to the Utopia women through the media of textile and batik. And meeting the Utopian women in their place made my heart sing. I loved creating artworks out of the environment – capturing the elements of nature, to translate into print or monoprint. Over the years I sent white cotton skirts and leggings to Utopia, the women covered them in beautiful batik patterns and stories, sent them back, and they were shown in my studio. Following this trip I moved to a large studio space in Kings Cross. The Bush Couture collection was created as the first salon show held in the studio in September 1982. It featured ragged edges, zigzag petal shapes, metallic inks, fluoro colours, opals, flowers and the land. I was experimenting with unorthodox ways of printing and making cloth, exploiting chance and surprise to mark and monoprint. I used stencils, gum leaves, string, crunching and pleating the cloth to create resists, and mixed metallic gold and silver with earth ochres, black, ultra violet and fluorescent colours. 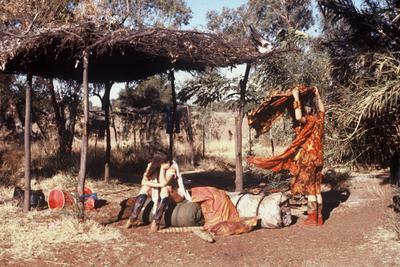 My studio in William Street, Kings Cross, was not quite like the open-air studio of the Utopia women, but I filled my space and small stage with elements of the Red Centre and the bush: corrugated tin sheets, rusting tin billy-cans, bush prints, red dirt and gum leaves. Aboriginal art from the Centre and Arnhem Land was hung on the walls. I was bringing the bush to town. I wanted to just wrap and drape the Utopia fabrics, cut simple shapes but with Desert style and chic. The collaborative artworks were shown in my studio and combined with RM Williams Akubra hats and boots. Bond singlets were dyed and printed. It was the creation of a true blue truly Oz style, and became my way of keeping the bush spirit alive in the city. Included in the AGSA exhibition is a Keringke Arts collaboration and several other Alice Springs inspired artworks on silk and cotton.